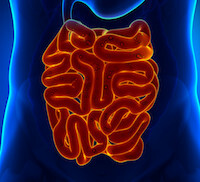 Patients with small intestine neuroendocrine tumors often have mesenteric tumor deposits (MTDs) in the abdomen – discrete tumor nodules that are not connected to the primary tumor. The clinical significance of these tumor deposits has not been thoroughly investigated, and they are not included in the American Join t Committee on Cancer (AJCC) staging system for midgut neuroendocrine tumors. Chanjuan Shi, M.D., Ph.D., and colleagues examined the prognostic significance of MTDs associated with midgut neuroendocrine tumors in 132 patients. Using pathologic slides from resected tumors and electronic medical records, the researchers reviewed AJCC tumor stage, lymph node and liver metastasis, presence of MTDs and survival data. They found that the presence of MTDs, but not the primary tumor’s histologic grade or lymph node metastasis, was a strong predictor for liver metastasis and was associated with poor disease-specific survival. The findings, reported in the January issue of The American Journal of Surgical Pathology, support including MTDs in the next AJCC cancer-staging algorithm for midgut neuroendocrine tumors. This research was supported by grants from the National Institutes of Health (DK058404, CA095103).